Brian Witherell poses with a zinc cigar store Indian. Photos by Doug Sandberg. 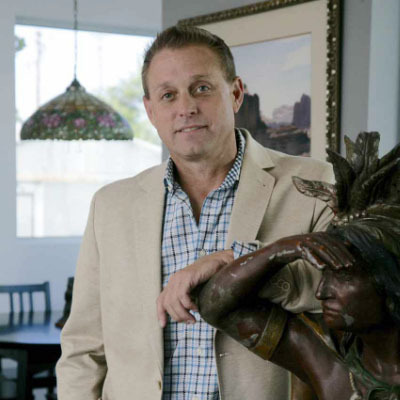 With a deep interest in preserving artifacts of the past, Brian Witherell has been actively involved in the antiques industry as a dealer, auctioneer and appraiser since youth. 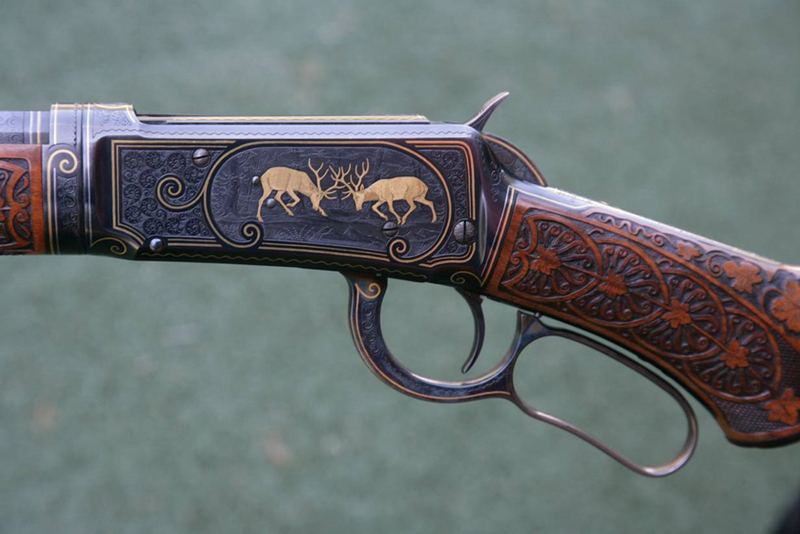 Together with his father, Brad, he operates an auction gallery in Sacramento, Calif., specializing in investment-grade firearms, Western Americana and Nineteenth Century American furniture. Witherell’s also runs the Grass Valley Old West show every spring (this year’s show is May 6–7). You grew up with antiques; were you always interested in working in the family business? I’ve always worked in the family business and knew when I was going to college that was exactly what I wanted to do, but I got a degree in criminal justice because I flirted with the idea of joining the FBI in high school. There’s a lot of parallel between law enforcement and the antiques business, but there’s not as much risk. You’re always looking for clues. I was always attracted to solving mysteries and discovering missing links. What’s it been like on Antiques Roadshow? The most important part of working with the Roadshow is the camaraderie between appraisers and crew — and the relationships that have developed as a result of that. That’s what I look forward to the most. It reminds me of “double days” in football. You can’t share the experience with anyone who hasn’t been through it. No one else appreciates the time and effort that goes into it. That said, we do work 12-hour days, very intense days where you are at your peak — you’re always on — the whole time. When you are with clients on the floor, you want to give them a good experience. They have waited hours in line to see you. You only get a few minutes to get the information to them in a polite and thoughtful way that is gratifying to them. The opportunity for a great discovery, the opportunity to give people information they never would have gotten otherwise, is what makes the Roadshow so fantastic. What’s the best or most interesting item you’ve gotten to appraise there? Last summer when a Jacob Ziegler parlor cabinet came up on Antiques Roadshow, that was very interesting. This piece of furniture was on the floor with a label on the back that the owner had never seen. While people can sometimes play dumb, I think no one had looked because it had been in the family for 150 years. As a result, the cabinet had never been identified. And it was a cabinetmaker we know very little about today — even though he was a primary player during his time period. While it wasn’t the most expensive item, it was the most rewarding for me because I was really able to provide that client with a great deal of information that they wouldn’t have any idea of otherwise. Up to that point, they hadn’t been able to find anything. That kind of experience extends beyond being on a television show. That’s an object that now has a place in history. This cabinetmaker had only three identified pieces until then. Now we’ve added another object to the collection for future people to study and make a connection about, which will lead to more understanding of the time period. We recorded an important object for history. This newly discovered Winchester rifle was sold by a dealer at last year’s Old West Show for a price in the mid-six figures. Tell us about the direction your business has moved into. Our business has been growing at a tremendous rate but we want to make sure we don’t lose the feeling that comes from a family-run business that cares about their integrity in representing both buyers and sellers. You don’t usually represent both. That is unique in our industry — unlike any other I know of. We take pride in the fact that we represent both well. We’re also different in our pairing of an antiques show and an auction. Making an event is a specialty few auction companies can provide. At this time, antiques shows can’t just rely on having antiques on display. They need to have more to it to make it interesting in the Twenty-First Century to younger audiences accustomed to a different type of presentation. Going to a Bass Pro Shop isn’t the same experience today as going to the sporting goods store 30 years ago. Tell us about the current pairing of the auction and the Old West Show. What antiques do you personally collect? I’d like to say I was like Israel Sack and collected my mistakes and lived with them so as to never repeat the error, but it’s too depressing. To be honest, we do not collect with any focus nor do we collect much. We collect for color and form that fits our home and interesting items that remind us of a friend, a discovery or a milestone event. We really enjoy discovering and selling antiques.